after two successful shows in 2016. The Island Centre, St Ives. Saturday 8th - Sunday 9th April 2017. Entry: £2.00 (under 18s and students free). organised by St Ives textile artist Jo McIntosh. The focus is entirely on craft supplies, rather than finished products. knitting and stitching - textiles - craft supplies. 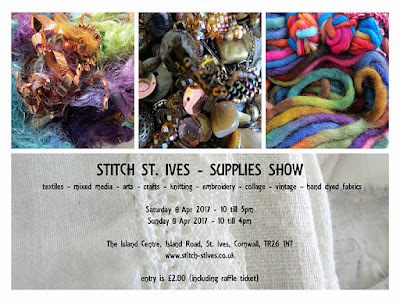 Food and drink all day by Cafe Art St Ives. Exhibitors come from around Cornwall and the UK - so that crafters can meet the suppliers and see the goods - rather than buying online. The Island Centre venue is easy to get to. A short walk from the harbour and the town centre. Next door to a large public car park. So come along to enjoy a creative crafty day out - browse the stalls, enjoy a coffee and cake, enjoy a craft demonstration, browse some more! You can also enjoy all the rest that St Ives has to offer - galleries, shops, restaurants and wonderful scenery. We look forward to welcoming you!